STATEN ISLAND, N.Y. — An area of snow showers will move over the region this afternoon, according to a special weather statement issued by the National Weather Service. Less than an inch of accumulation is expected. An area of snow showers will move over the region from Eastern Pennsylvania this afternoon. While there were some flurries scattered around the region during the noon hour, this main area of snow showers will move in during the mid afternoon and is forecast to move out by early evening. The snow showers are expected to produce less than an inch of accumulation with little or no accumulation expected on area roadways due to temperatures in the lower to middle 30s. Staten Islanders today are struggling to figure out where to put mounds of snow as they shovel after another storm dropped 18 inches yesterday. 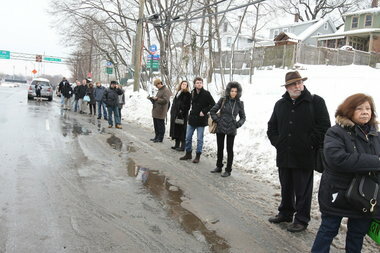 Residents have also flooded 311 with calls to complain about unplowed streets.